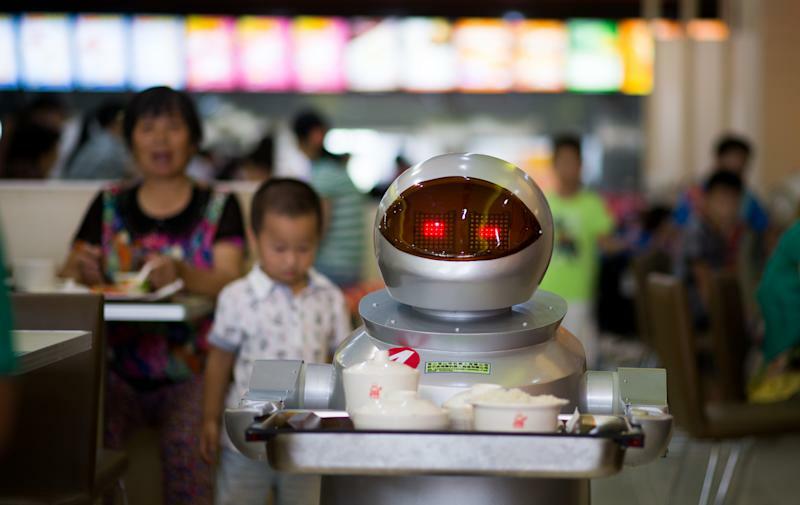 It's more teatime than Terminator -- a restaurant in China is electrifying customers by using more than a dozen robots to cook and deliver food. Mechanical staff greet customers, deliver dishes to tables and even stir-fry meat and vegetables at the eatery in Kunshan, which opened last week. "My daughter asked me to invent a robot because she doesn't like doing housework," the restaurant's founder Song Yugang told AFP. Two robots are stationed by the door to cheerfully greet customers, while four short but humanoid machines carry trays of food to the tables. In the kitchen, two large blue robots with glowing red eyes specialise in frying, while another is dedicated to making dumplings. Song told the local Modern Times newspaper that each robot costs around 40,000 yuan ($6,500) -- roughly equal to the annual salary of a human employee. "The robots can understand 40 everyday sentences. They can't get sick or ask for vacation. After charging up for two hours they can work for five hours," he added. 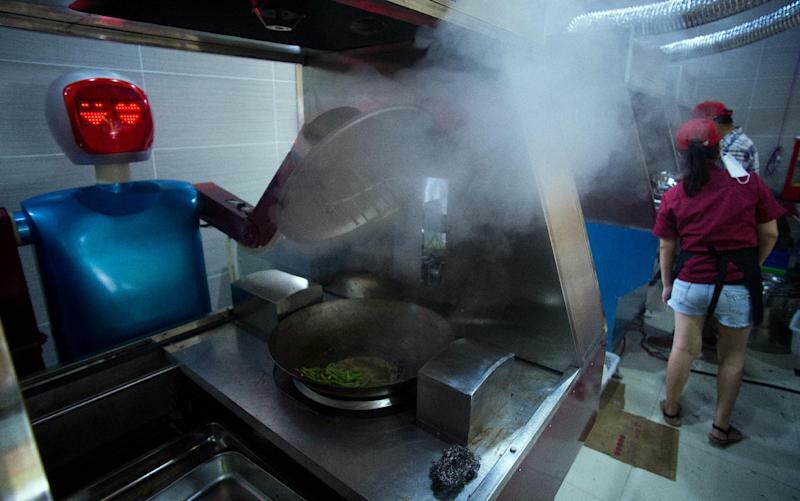 The restaurant, in the eastern province of Jiangsu, follows in the tracks of another robotic eatery which opened in the northeastern city of Harbin in 2012. Rising labour costs in China have encouraged manufacturers to turn to automation, and the country last year surpassed Japan to become the world's biggest consumer of industrial robots. The cooking robots -- which have a fixed repertoire -- exhibit limited artificial intelligence, and are loaded with ingredients by human staff, who also help to make some dishes. But customers at the restaurant who tucked into fried tomatoes with egg, soup, and rice were thrilled with the experience. "My children are really excited by the robots," said Yang Limei, a mother of three. The round-headed waiter robots can only move along fixed paths, and politely ask customers to move out of their way whenever their routes are blocked. 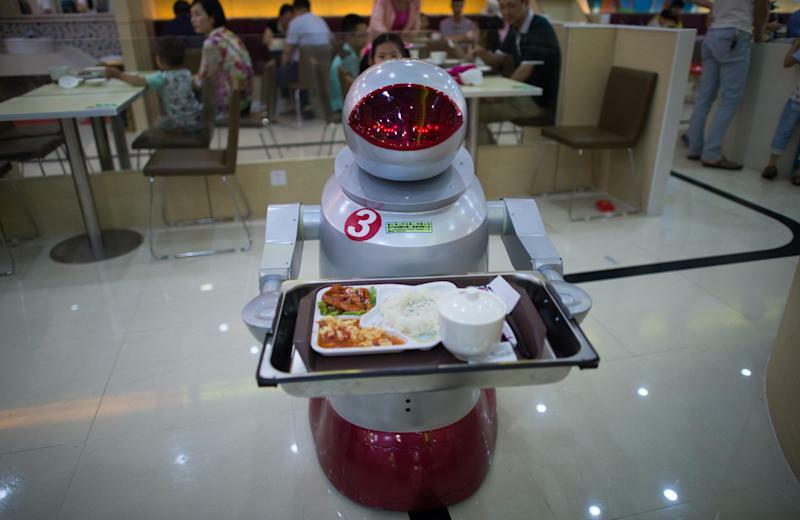 "I've never seen a robot serving food before," said Yuan Yuan, nine. "I'm really surprised."